The increased numbers of infirmities have been noted to cause dis-functioning of various organs that require being transplanted. To enhance efficiency in the transplant, rationing of these life-saving procedures should be induced and properly implemented. This will entail the incorporation of proper criteria for the selection of patients to undergo a transplant besides the allocation of a certain organ to the right individual. Conversely, there are various ethical and fruitful ways of rationing organs for transplant that will be elaborated in this paper. The first ethical way of rationing organs for transplant is through the implementation of the needs and outcome policy. Under the needs plan, those patients that depict the greatest risk of death are prioritized (Neuberger, 2011). This is an efficient system since it has saved the lives of those patients that are on the verge of dying. The lives of those saved as a result of this initiative are of great importance to the Kenyan economy since their skill can be harnessed and hence contribute to the growth and development of the economy. However, despite the success of this policy, it has been associated with increased medication costs alongside denying the access to transplantation to patients with proper organ function but the unacceptable quality of life that can only be corrected through transplantation (Neuberger, 2011). Therefore, the right to die in this life-saving policy must be balanced with that of an intolerable quality of life. Also, the outcome of the transplant is a core factor in arriving at an ethical means of organ transplant. These results may be based on those patients listed for transplantation, absolute or adjusted for quality of life, and whether the transplant will be for the patient or the graft (Neuberger, 2011). 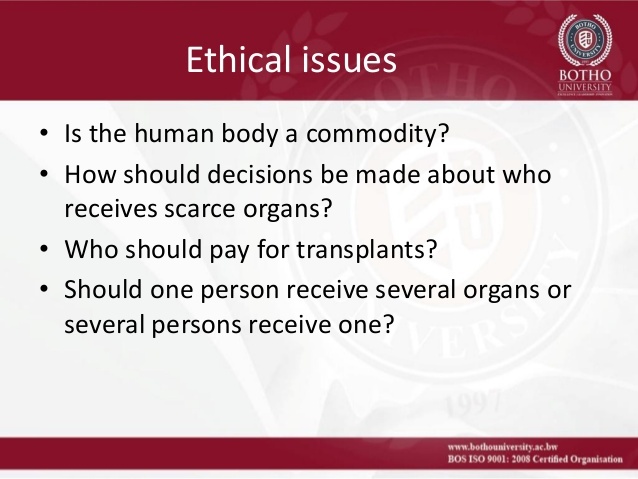 Moreover, the other means that will ensure that there is ethical and fruitful rationing of organs will entail the benefit accrued because of the transplant (Neuberger, 2011). In this criterion, the transplant should be allocated to that recipient who will have the maximum benefit when the survival without and with the transplant is estimated (Howard & Cornell, 2016). Those individuals with the shortest expected survival without the transplantation may be the sickest and hence may be preferred over the rest patients. On the other hand, the post-transplant survival may be reduced in a less sick patient together with the utility and an increase in the health-care costs (Neuberger, 2011). On the contrary, the concept of minimum benefit has also been accepted in some instances such as for the liver patients. The condition under which this condition is recognized is when the patient has a 50% probability of surviving five years with a quality of life that is acceptable to the recipient (Neuberger, 2011). For proper rationing of organs for transplant, equity must take center stage of this whole procedure. This has been proven to be an effective way of rationing organs for transplant since every person who requires a transplant will have a similar opportunity, regardless of other factors such as age, gender, and the expected survival with or without the transplant (Neuberger, 2011). Equity policy may be properly implemented if is on a first come first-served basis (Howard & Cornell, 2016). However, other factors such as the blood groups of the donor and the recipient must be checked to prevent transplantation of organs that differ in the blood groups with the winner as this may cause blood clotting. Moreover, geographic equity should also be incorporated in such a way that individuals awaiting a graft will be entitled to the same chance of getting it irrespective of their place of residence (Howard & Cornell, 2016). Conclusively, the ways discussed above are the most effective means of ensuring the presence of an ethical and fruitful rationing of organs for transplant. The assessment of how needy an individual is will help in saving the lives of the sickest patients within health care facilities. Moreover, the outcome policy and the benefit accrued as a result of implementing the transplant will ensure that those who will benefit mostly get the graft on time. Therefore, the implementation of these measures together with the equity policy will enhance quality health care services offered to patients thus increasing the reputation of these facilities (Howard & Cornell, 2016). This will go a long way into increasing the revenues earned by the hospitals hence resulting in proper payment of the staff.